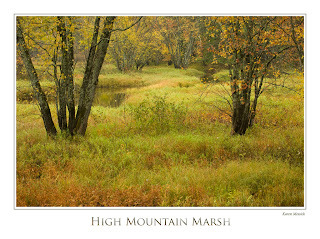 Just processed a few more from the Adirondacks trip. I was definitely in a landscape mode. I never even got the macro lens out of the bag. The Landscapes are both grand and intimate in the Adirondacks, but always, beautiful. We traveled up a high mountain two track hoping to end at a pond, only to find several miles into the forest, there was a huge gate across the road. On the way up we passed a beautiful open area in the forest, which had a grove of maples growing out of the soft grasses in a marshy area. There was a little mystery to me as to why the trees had all grown in a vase like shape, and spaced so neatly apart. I was summoning the spirit of Eliot Porter while there among the trees to help me get some forest vision, it just felt like a place he would have enjoyed. I am a great fan of his work and philosophy. I wasn't sure if I could create a composition that I liked with this scene, but I think I like this very much! 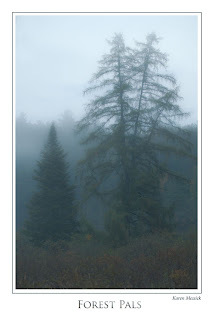 The Forest Pals shot was a quick grab, as we traveled down the highway back to dinner, a rainstorm occurred, but there was a break in the rain as we came through a misty low area, I had to stop and make a few exposures in very low light with the evening mist encroaching on the low lands. 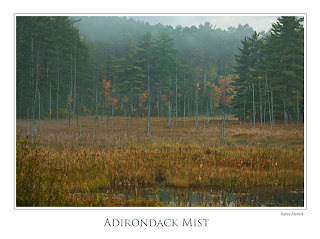 Adirondacks Mist was shot at the same time on the opposite side of the road. After making a few shots the mist lifted and the scene was all together different.